In 1874 there was a union of two districts in Boothbay Harbor and the following year a high school was built. There were three rooms and the grades were: primary, intermediate, and grammar. The building was first used for the winter terms after being dedicated with appropriate ceremonies. The grammar school was taught by L. F. Coburn, Brunswick, the intermediate by Miss P. H. Burr, Mercer, and the Primary by Miss Georgia E. Hodgdon, Boothbay, now Mrs. W. R. Holton. The grade school building at Boothbay Center was built in 1877, the grades being grammar and primary. As in the other cases the first schools were taught in the winter following erection. The grammar school was taught by Miss Annie Adams, Boothbay, now Mrs. Woodbridge Reed, and the primary by Miss M. Ella Baker, Boothbay, now Mrs. Charles E. Sherman. Two terms of school, with an average length of ten weeks, were taught. Average wages per week in summer were $4.70; average wages per month in winter were $36.70; and the total school fund in 1880 was $4959.73. 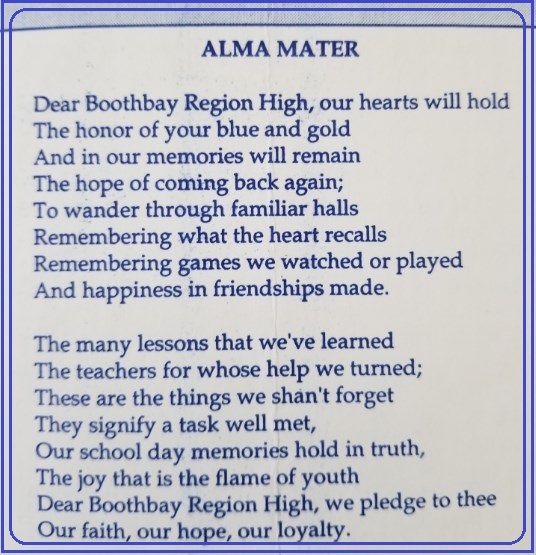 The first public graduation exercises held in either town were in 1893 by the graduating class from the Boothbay Harbor High School. They were arranged by F. B. Greene during his first year as superintendent and Edgar L. Simpson, the principal at the time. In 1893, the grades in the village schools was systematically established, alloting for each room the work for two years in each grade before the high school, and this included a regular college preparatory course. The course of study was printed, framed and hung in each room throughout the school. Since that date (1893) public graduations have regularly occurred and the course, from primary up, has been maintained with few variations from the form then established. In later years, The Grand March became a Boothbay Region tradition, the first one being held in 1911 at the Pythian Opera House. Source: Green, Francis Byron. History of Boothbay, and Boothbay Harbor, Maine. Portland, ME: Loring, Short and Harmon, 1906.